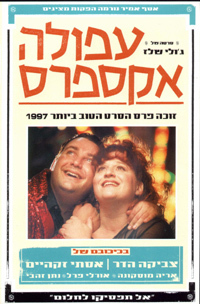 Israel’s harsh and demanding reality makes for the setting of Afula Express, A dramatic warm comedy about little people trying to fulfill big dreams in the big city: Tel-Aviv. David is a car electrician from Afila, a small town in northen Israel near Nazareth. David’s got a girlfriend, Batia. She is a big woman, hardly pretty, but when Batia smiles everything about her looks beautiful. One day David gets fed up and decides to leave the small town and move to Tel-Aviv and go after his childhood dream, to be a…magician! There was just one, small factor the couple didn’t take into account. David hasn’t got it. He is the worst magician that ever lived. This leads to hardship and causes conflicts.It is the fuel for drama and comedy as our two heroes face up to the difference between dreams and reality. Will their love triumph? Is there magic in reality? Is love a form of magic? As in her documentary films (St. Jean and Baba Luba), so in her first feature film, Afula Express, Julie Shles sweeps her audience along an emotional journey into the intimate lives of her heroes and heroines. Her unusual camera work is at once rough and penetrating -together with the use and integration of documentary footage, as part of the story, this film a unique experience for the viewer.